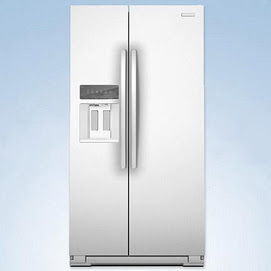 Clients ask me all the time, what is a standard size for a refrigerator? My answer: there is no such thing as a standard size. Fridges, like houses are getting bigger every year, and the standard size we are used to (the 30″ wide model with the freezer on the top) is not sufficient for most households. How many people will be fed out of the fridge? The requirements of empty-nesters are much different that families of 6+. What type of food are you storing? If you stock-up weekly on fresh produce, you will require more fridge space. If you are more inclined to buy bulk-frozen produce, then freezer space and accessibility may be more important. 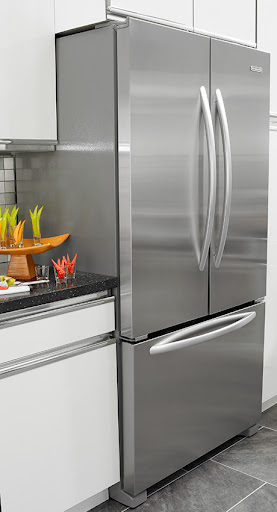 These refrigerators are your largest option if you are concerned about storage space. The depth can range from 30″ to 38″ , with widths of 30″, 33″, and 36″ (approx. ), and heights from 65″ to 72″. They can be french door, side by side, single door over drawer or full fridge models. Please be aware that the appliance will protrude beyond the depth of the adjacent cabinetry. 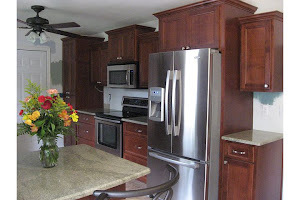 There are numerous design tricks available to hide the bulky look of a full-depth refrigerator, so please let me know early in the process if this is the route you are taking and I will design the cabinetry around it accordingly. 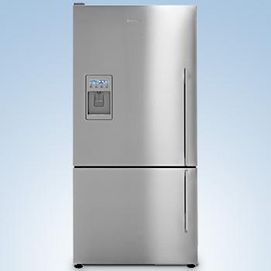 This is currently the most popular choice for refrigerator in most styles of kitchens. Generally, the box of the fridge is the same depth as a countertop- 25″ deep, with the door only sticking beyond the counters. This gives you a semi-integrated look without the expense of a built-in appliance. 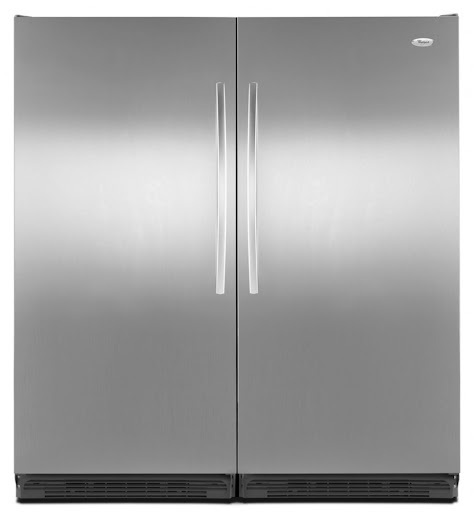 Counter Depth fridges are generally available as a French-Door Fridge (shown to left) 33″ or 36″ wide, Door over Drawer 30, 33 or 36″ wide, Side by Side 33 or 36″ wide. Another Counter Depth option that is less common is to have a Full Fridge 32″ wide and a Full Freezer 32″Wide installed side by side with a trim-kit for a built-in look. Some models are also available to accept cabinet door faces, for a more integraged look, but please note, that this is not a substitute for a true built-in fridge, as the doors will still protrude from the face of the cabinetry. 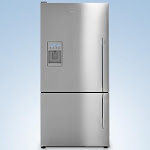 Generally reserved for the highest end of the market, the built-in refrigerator/freezer is the largest, and most integrated option available. These are generally reduced depth, with the doors of the appliance sitting flush with the face of the cabinetry. 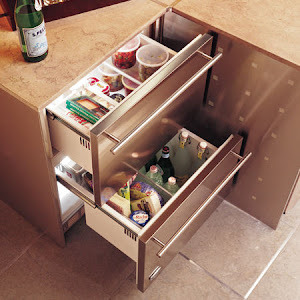 The ventilation for the appliance is located at the top, allowing room for more food storage at a more ergonomic height. Some models are available with glass doors, or even made to accept door panels to better blend in with your cabinetry. We don’t see refrigerator drawers very often, but they certainly deserve a double-take! These work well in a Minimalist space where eye-level appliances might be undesirable. These are also great for just a snack drawer for the kids (or grown-ups! ).